Stephanie Morris was interested in art and drawing, and loved to bake. She took some informal decorating classes but is primarily self-trained. In January 2011 she decided to turn a hobby into a business--and For Cake's Sake was born. 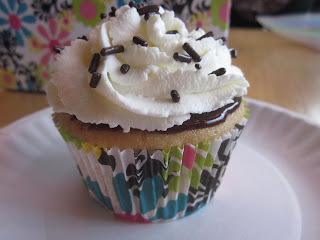 The white cake with ganache topping and whipped cream reminded me of chocolate chip ice cream. The cake was moist and the flavor of the ganache mixed well with the whipped cream. All in all I would say this cupcake was made for romance. Valentine's Day and strawberries kept going through my head while I sampled this cupcake. 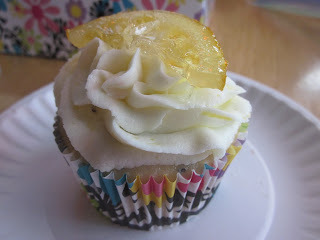 The second cupcake was a new recipe in which Morris asked me to try--lemon poppyseed with lemon zest, and topped with lemon buttercream and a candied lemon slice. Although the lemon slice was decorative and was removed (not eaten), the lemon poppyseed cake was tasty, dense but great texture, but with the frosting the poppyseeds were unnecessary. In other words, the cake was good, the icing was good, but the poppyseeds had a texture that seemed out of place in that particular cupcake. Now if the frosting was a glaze instead, it would have worked beautifully, and Morris agreed. Once this recipe is down it is going to be really great! The last cake was a strawberry cake with cream cheese frosting and sprinkles. The cake was sweet and extremely moist, with a nice flavor accompanied by the cream cheese frosting, which offered a slight bitter flavor--making this combination work very well together. With the sprinkles, it looked like a party cake, one which a child would want to eat at a birthday party. Morris housed the remnants of my cupcakes up in a beautiful box and I took them home to share with my family. When I opened the box and my sons saw the strawberry cupcake they both wanted to eat it. My 4 year old said, "That's awesome!" 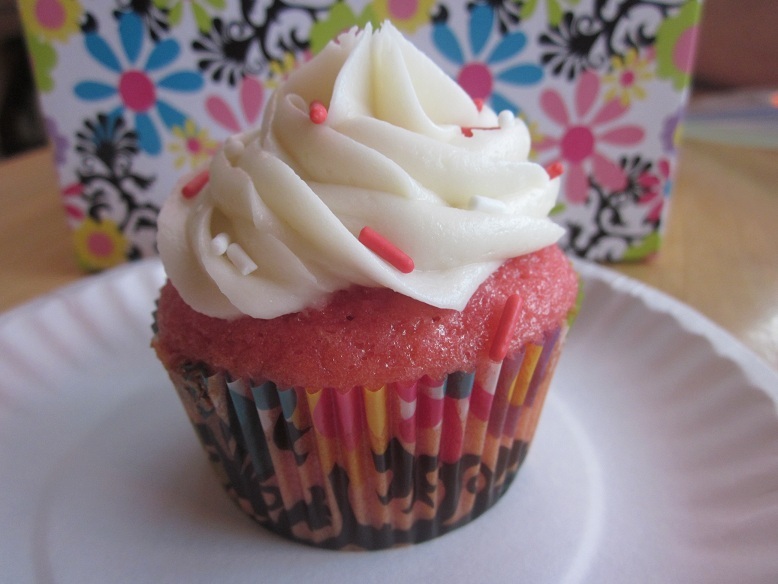 It is the perfect cupcake for a little one.